Bulk SMS Multi USB Modem software facilitates user to send mobile text messages on any national or international mobile number without internet gateway. 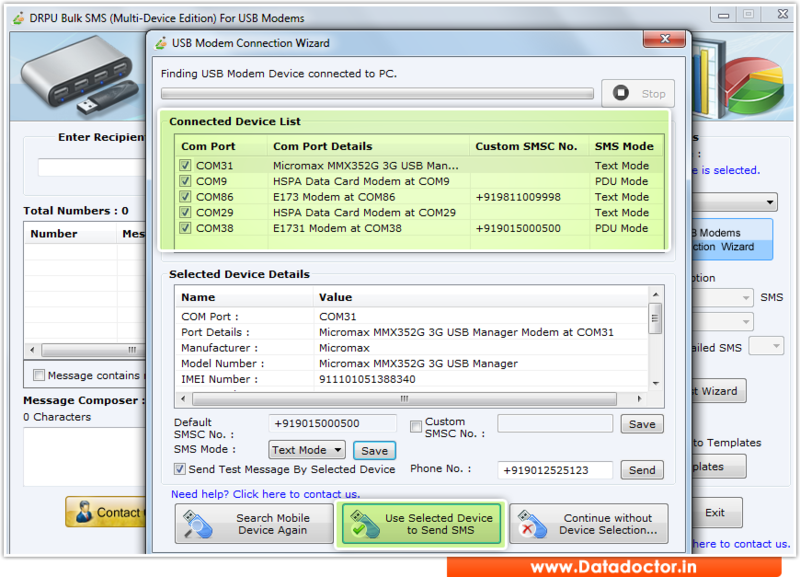 Text messaging program provide option to connect multiple number of USB modems with PC to deliver group SMS. Text messaging application sends bulk SMS via connecting multi USB modem from computer system to any other mobile phone. Bulk text messaging program provides facility to connect with business partners, customers, clients, friends and relatives across the world by sending instant SMS. Group text messaging program composes and delivers bulk text SMS with support to multilingual characters worldwide in different languages. Bulk SMS software sends text messages and facilitates to save your sent text SMS for any future reference. » Bulk SMS software facilitates to send group text messages from PC to any other mobile phone. » Group SMS software sends price alerts, notifications to promote your business product globally. » Software offers facility to load contact number from Excel file or phonebook. » Bulk SMS software sends text alerts and skips duplicate contact number while sending SMS. » Works with all types of USB modems of any brand available in market. » No internet connection is required to deliver SMS text alerts on any mobile phone.